Call us confused. Unless we're missing something, Samsung has installed Android 4.0 Ice Cream Sandwich on a chubbier, slower version of the Galaxy Tab 7.0 Plus and rebranded it the Galaxy Tab 2. I hate to open a post with such an accusatory tone, but I've read (and reread) today's press release and that's precisely what I see comparing the specifications between each "generation." The Galaxy Tab 2 shaves some bulk off the original 2010 design, measuring 10.5mm thick and weighing 344g (down from 11.98mm and 380g), but it's a tad thicker than September's Galaxy Tab 7.0 Plus (9.96mm). 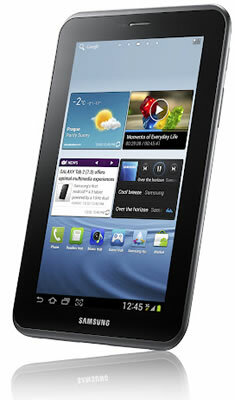 Assuming it uses the same chip architecture, the Galaxy Tab 2 also downgrades the Tab 7.0 Plus' 1.2GHz processor to 1.0GHz (which is in line with the original Galaxy Tab 7.0). Other innards are virtually identical to the Galaxy Tab 7.0 Plus. This includes a 7-inch WSVGA (1024x600) PLS TFT touchscreen, a 3-megapixel rear camera and VGA front camera (downgraded from the Galaxy Tab 7.0 Plus' 2-megapixel front camera), 1GB of RAM, and 8GB to 32GB of storage (another 32GB via microSD). Select models have 3G support alongside Wi-Fi and Bluetooth 3.0. Along with Google's latest snack-themed OS, the Galaxy Tab 2 will feature Samsung's new AllShare Play service, which lets you stream multimedia content between compatible devices. Neither piece of software is enough to justify a new model and the Galaxy Tab 7.0 Plus is expected to get ICS sometime this spring anyway -- presumably around the time the Galaxy Tab 2 hits shelves. The only way we can make sense of this: the Galaxy Tab 2 will be priced low enough to compete with the Kindle Fire (despite lacking Amazon's library). Unfortunately, the company hasn't shared official international pricing yet, but PCWorld reports that Samsung Sweden claims the Wi-Fi model will cost €270 (roughly $350). SammyHub reports even higher figures at ~$450 with a $100 premium for 3G. Hopefully Samsung clarifies its plans for the Galaxy Tab 2 at Mobile World Congress in two weeks.